During the 1890s Elliott Coues (1842-1899), one of America's greatest ornithologists, edited several exploration narratives about the American Northwest, including Lewis and Clark's Travels. Coues tracked down the manuscript journals of two of Lewis and Clark's contemporaries, fur trader Alexander Henry (1765-1814) and geographer David Thompson (1770-1857), employees of the Northwest Company. Coues' abridged and edited version of Henry's text, accompanied by notes that draw heavily on Thompson's scientific records, appeared in 1897 in three volumes. Despite the deep prejudice evident in Henry's writing, Coues judged it a reliable account of his unscrupulous business dealings, and of the harsh realities he observed among many different First Nations peoples. 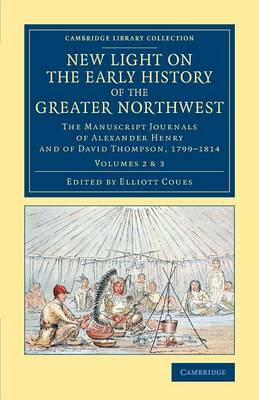 Volume 2 covers 1808-14, when Henry travelled in Saskatchewan and Alberta, crossed the Great Divide, and traded along the Columbia River. This volume also contains Coues' original Volume 3, a comprehensive index of people and places.